Mountain huts, used by climbers to break up ascents into multi-day trips, are utilitarian in the extreme — everything has to either be flown up by helicopter, or carried over unfriendly terrain on someone’s back. So it’s unusual to see a hut that actually looks good. For example, the new Gouter refuge on Mont Blanc, Europe’s highest mountain, looks like an alien spaceship designed by a Bond villain. 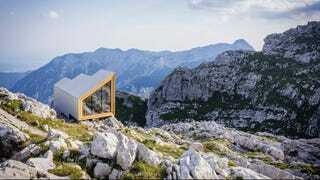 But you can’t say the same for this (much smaller) refuge high in the Slovenian mountains. Designed by Harvard students during an architecture workshop, it uses a mixture of glass fiber, concrete panels and triple-glazing to withstand the mountain weather. It was constructed off-site, and transported by helicopter to the final location in three pieces. Inside, it’s still starkly utilitarian, but the floor-to-ceiling windows and timber panelling make it look like a luxury ski lodge. Most mountain refuges I’ve spent time in are dark and basically rotting; it would be nice to experience nature in a little comfort (or without hanging off a cliff, for that matter).